The Oil Filter is a low cost part that needs regular replacing. Essentially its role is as the name suggests - to filter and remove dirt particles from the oil as it flows through the engine. It also allows for efficient lubrication of the hundreds of precision moving parts in your car's engine. Many of these parts operate at thousands of movements per minute. Even the tiniest foreign matter in your engine can create excess friction and damage. Oil Filters help prevent potential engine damage from happening. Long life engine performance & protection. A Toyota Genuine Oil Filter features a dual-textured element - coarse on the outside, fine on the inside. This combination filters particles effectively and resists clogging. Non-genuine brands can be thin and finely meshed, making them prone to tearing and clogging, and as a result could need replacement more often. A Toyota Genuine Oil Filter features two valves - a Bypass Valve which allows vital oil to still flow in the event of a filter becoming clogged, and an anti drain-back valve which prevents oil draining out of the engine and into the oil pan. 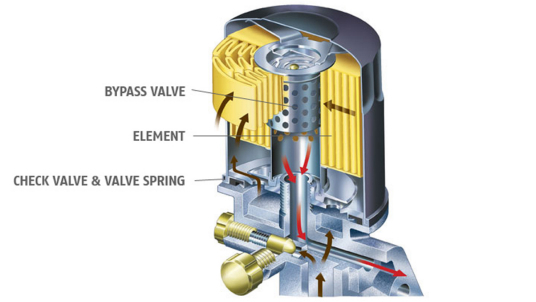 This valve helps protect your engine from increased wear during cold starts.